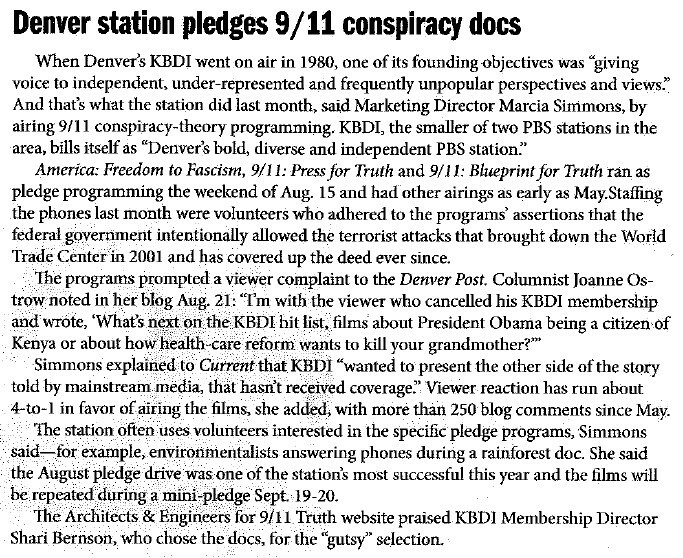 Recent airings by KBDI-TV Channel 12 in Denver Colorado of important documentaries such as 911 Press For Truth and 911 Blueprint For Truth has received substantial mainstream media attention, first, here in the Denver Post hit piece from August 21, 2009. Current Magazine, public broadcasting’s monthly newspaper, has now given this bold move by KBDI some well deserved attention in its September 8, 2009 issue. This article is much more balanced than Joanne Ostrow’s disrespectful treatment of the 9-11 truth movement and is more in line with real journalism that is so lacking in today’s mainstream media. Thank you to Current Magazine!